104 keys include customizable media hotkeys that help you surf the Internet, and put your commonly accessed music, photos and movies at your fingertips. Compact design can be stored almost anywhere. Wireless USB connectivity allows flexible use. Compatible with most Windows PCs and select USB HID-compliant smart televisions and gaming consoles. Multitouch trackpad allows easy navigation. Volume controls are positioned for fast access. Spill-resistant design offers added durability. Includes 2 AAA alkaline batteries. Full size key set and integrated multi-touch track pad make it easier to type, swipe, drag, zoom, and click. Control your music and movies with customizable media hot keys. Volume controls are positioned for easy access. Durable, spill-resistant design helps prevent damage from accidental bumps, drops and spills. Features wireless connectivity. Plug the USB transmitter into a compatible computer, TV or gaming console to set up your wireless transmission. Uses 2 AAA batteries, which are included. 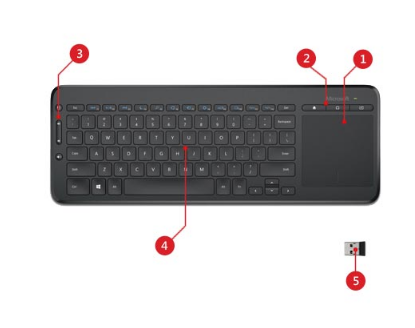 Upgrade your living room or home office with a keyboard that makes it easy to manage your entertainment. Its full-size keyset and integrated multi-touch trackpad allow you to type, swipe, drag, zoom and click with ease. Tailor the media hotkeys to your taste, and find your music, photos, movies and the web at your fingertips. Wirelessly connect to your PC via a USB transceiver, and use it with a Smart TV or game console that accepts the USB HID standard. And with its durable design, there’s no need to sweat everyday bumps, drops or spills.